The American Legislative Exchange Council (ALEC), a conservative nonprofit whose membership includes state legislators, corporations, and think tanks, is holding it’s 2018 States and Nation Policy Summit in Washington, DC this week. ALEC has been called a “corporate bill mill,” helping secure favorable state legislation for some of the largest companies in the country. However, the last few years have seen a mass exodus of corporate members. CIC has tabulated that the companies who have quit ALEC since 2011 have a total market cap of over $7 trillion based on values from the S&P 500. This tide of corporate quitters includes some of the most highly valued companies in the United States and the world, such as Alphabet Inc. (parent company to Google), Microsoft, Johnson & Johnson, Berkshire Hathaway Inc., and Amazon. Oil giants Exxon, Shell, and BP have also abandoned the organization over the past few years. Despite lucrative membership perks, such as access to lawmakers and a direct hand in drafting model legislation, we’ve found that twelve of the S&P 500’s top fifteen companies that were once members of ALEC, have jumped ship. Notably, Koch industries, the fossil fuel giant who for decades has seamlessly intertwined its corporate interests into ALEC’s political agenda, has been unwavering in it’s membership. ALEC’s value proposition to corporate interests is that they can operate behind closed doors to write and push state legislative initiatives without showing their fingerprints. Since the 2011 revelation of ALEC’s library of model bills by the Center for Media and Democracy, ALEC and its members have been under increasing scrutiny, causing many mainstream and consumer brand companies to leave the organization. In 2012, after ALEC was shown to be promoting model legislation similar to Florida’s “stand-your-ground” gun rights law, which was used to defend the shooting of Trayvon Martin, an unarmed black teenager, ALEC lost many large corporate members such as Amazon, Coca-Cola, General Electric, Kraft, McDonald’s and Walmart. More recently, ALEC’s anti-science climate position sparked a new round of corporate dissent. Beginning in 2014, corporations including Microsoft, Ford Motor Co., Expedia Group, Google, Yahoo, Facebook, eBay, and Yelp cut ties with ALEC in the wake of its efforts to draft model legislation that denied anthropogenic climate change. Fossil fuel companies, including Royal Dutch Shell, BP, ConocoPhillips and Occidental Petroleum have left ALEC in recent years after long memberships. As Occidental put it, the company wanted to avoid “reputational and business risk” likely from supporting anti-science policies. On July of 2018, ExxonMobil, a long time member and significant funder of ALEC over the past 20 years, decided to cancel its membership after a vigorous internal debate about a draft ALEC model bill that urged the Environmental Protection Agency (EPA) to reverse its conclusion that climate change was a threat to human health, the so-called “endangerment finding.” Leading the charge within ALEC was the Heartland Institute, a climate denying think tank once funded heavily by Exxon itself. Under pressure from multiple climate liability lawsuits nationwide that refer to Exxon’s history of funding climate denial since the 1990s, Exxon lawyers likely advised Exxon to exit ALEC once and for all. ALEC was named as a “potential fund allocator” in a 1998 American Petroleum Institute Global Climate Science Communications Plan, of which Exxon was a collaborative author. Even after this plan was revealed on the front page of the New York Times, Exxon plowed ahead. By 1999, ALEC and allies at the state level had managed to pass resolutions against climate regulations in 16 states — Alabama, Arizona, Colorado, Idaho, Illinois, Indiana, Kentucky, Michigan, Mississippi, North Dakota, Ohio, Pennsylvania, South Carolina, Virginia, West Virginia, and Wyoming. 4. Efforts to account for a Social Cost of Greenhouse Gases. 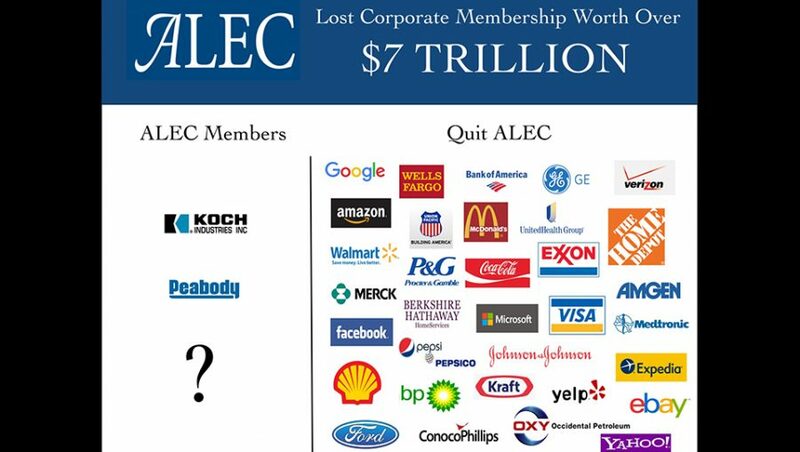 What companies are still members of ALEC besides Koch Industries? Why won’t ALEC publish a list of its members? What ALEC members wrote the current model bills and resolutions? Will the reality of ALEC’s shrinking popularity with corporations be discussed at this week’s meeting? This article was first published at the Climate Investigations Center. 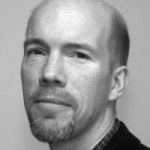 Kert Davies is the founder and director of Climate Investigations Center.